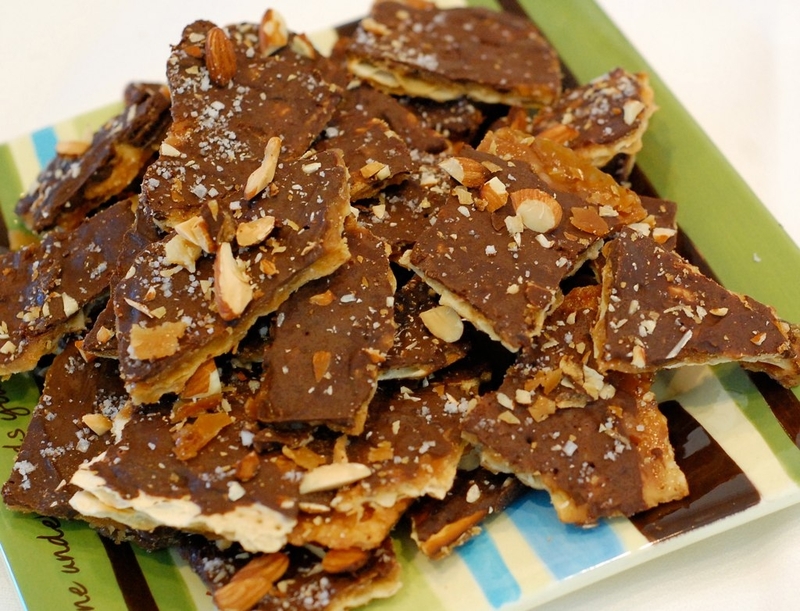 Blue Jean Gourmet | Unfussy food from a fun-loving kitchen. If you’ve been wondering where we’ve been, the answer is–spreading our wings! 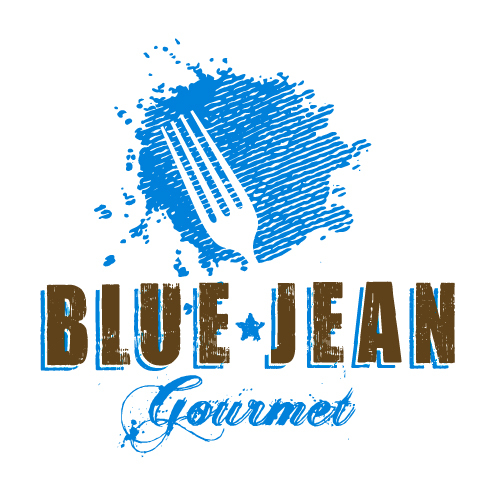 Please follow Blue Jean Gourmet on over to its new home & update your links accordingly. 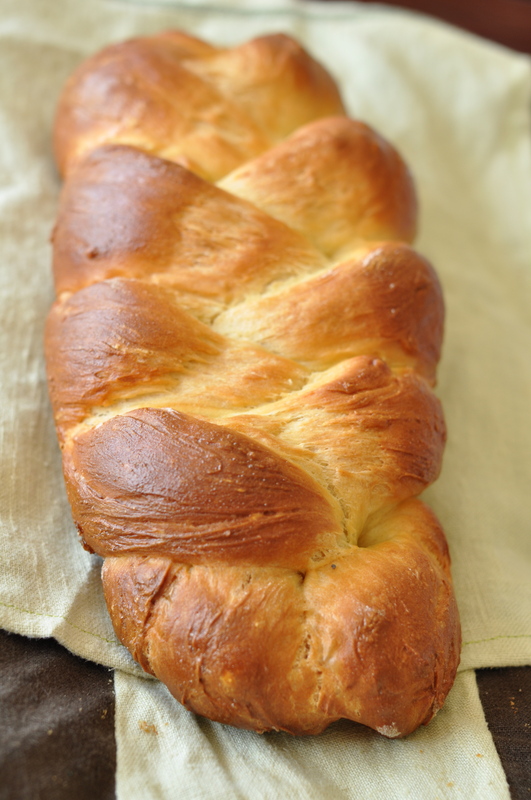 Remember last week’s guest posts from Jessie about baking bread? And remember when I told you that half of my batch of challah found its destiny in the form of some tasty, tasty hamburger buns? Now I’m not trying to tell you how to live your life, but there are few better ways to enjoy the changing season than home-cooked burgers and fries. Burgers and fries, burgers and fries. Have two things ever gone so well together? Even their names have a kind of lulling rhythmic rightness: burgers and fries, burgers and fries. There are approximately three zillion recipes out there for “the perfect burger,” “the diet burger,” “the California burger,” “the ultimate burger,” etc. I’m not claiming this burger is any of the above, but it did make for a very satisfying Saturday night dinner. I will also say that I believe the quality of the ground beef I used had everything to do with how good these burgers tasted. Jill and I purchase a meat share from a local farm here in Texas, and not only do we feel ethically good about supporting a small operation with well-treated animals, the meat just plain tastes better. Like, light-years better. And so if you haven’t, I urge you to check into and support small farms in your area. You can search here or stop by your local Farmers Market. Peel & dice the onion, then sauté in a little olive oil until soft & translucent. Set the onion aside to cool and in the meantime, grate the cheese & chop the parsley. Combine all ingredients in a large bowl, mixing well with your fingers. Form into patties of your desired size, keeping in mind that burgers shrink significantly when cooked. I usually make my patties very round & tall so that they’ll even out by the time they arrive on a bun. 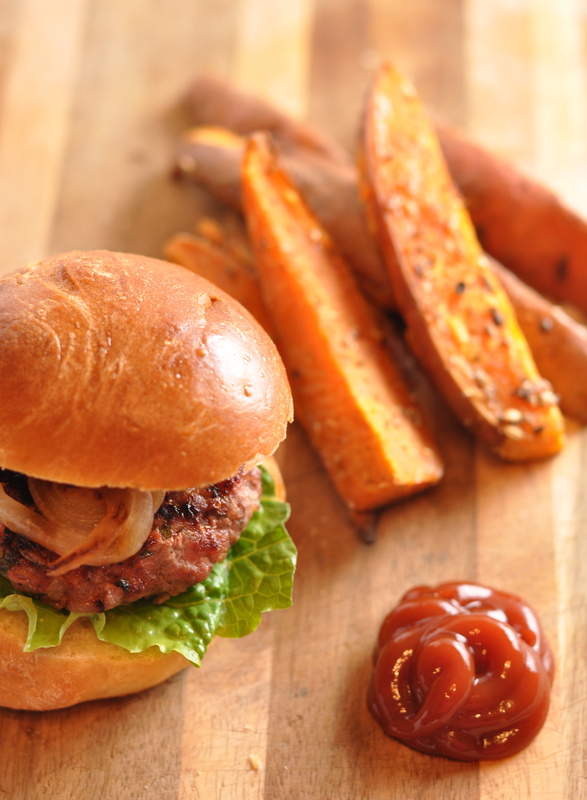 For an especially tasty burger, brush your buns with a little melted butter & add them to the grill for the last few minutes of cooking. Garnish burgers with desired condiments: grilled onion, avocado, tomato, lettuce, pickle, Dijon mustard, mayonnaise, etc. Cut the sweet potatoes into wedges—peeling them is not necessary. Grind the spices together with a mortar & pestle or spice grinder (the latter will, of course, result in a much finer grind). Place the potatoes in a large roasting pan; use two if need be, you don’t want to crowd the slices because they won’t crisp up. Toss the potatoes with a few tablespoons of oil to coat, then add the spices, distributing evenly. Roast for 40-45 minutes, turning the wedges halfway through and rotating the pans if you used two. Sprinkle generously with salt before serving. They are delicious plain, with ketchup, Sriacha, or this tamarind chutney. Perhaps it is a generational symptom, or hazard, to experience times in one’s life that are later identified as having felt “like a movie.” If serendipity, luck, or chance has played a large part, making one’s day unusually perfect or delightfully surprising, then “it was like a movie.” If terrible things have taken place, things no one could have foreseen, things one feels one might not make it through, then “it was like a movie,” also. From one morning in Mumbai, a particularly cinematic recollection. My father and I went out for a walk, just the two of us, traveling down the rickety elevator of his sister’s flat and out into the street. We worked across a few busy streets to the Five Gardens, where paths are reserved for pedestrians. The gardens are really more like well-shaded parks gated off from traffic. Of course, everywhere you turn in Mumbai is a veritable garden; given the hothouse climate, all manner of flowers and greenery grow. Each of the five gardens contains a different buzz of activity—a rousing game of cricket underway on one dusty circle, some quiet games of chess between old men under the shade of palm trees. At that point in my life, I aspired to be one of those people who can eat street food. I had read Bourdain, I bought into the romance of late nights, authenticity, and machismo. I believed him when he says that you don’t really know a place until you eat what everyone who lives there is lining up to eat on some random street corner. And I was willing to sacrifice some nights of peaceful sleep for a stomach of iron and some really good noodle bowls—I just hadn’t had much of a chance. In between trips to India, I only made one trip outside of the States—a college jaunt to Amsterdam, where the bragging rights for eating street food are not nearly as high as, say, Thailand or Japan. I did, however, take the liberty of consuming several cones of warm European frites with spicy mayonnaise in the wee hours of the morning, which I still crave when I am up very late and have been drinking. With the paper rupees in my father’s wallet, we feasted on watermelon, mango, coconut milk straight from the fruit, and shared a crunchy helping of sev puri. The Indian food smorgasborg, sev puri is a classic street food, a weird, delicious concoction of spicy cooked potatoes, raw onions, the option of boiled moong beans (they taste like mild peas but are a little more toothsome), and drizzles of dhania (cilantro) and imli (tamarind, my favorite) chutnies atop a bed of salty, crunchy chips and twigs made from chickpea flour. Served in a big, Styrofoam cup with a plastic spoon, our snack was well worth the risk of intestinal distress, as well as my mother’s dismay, though we managed to keep the secret together, and I am spilling it now. 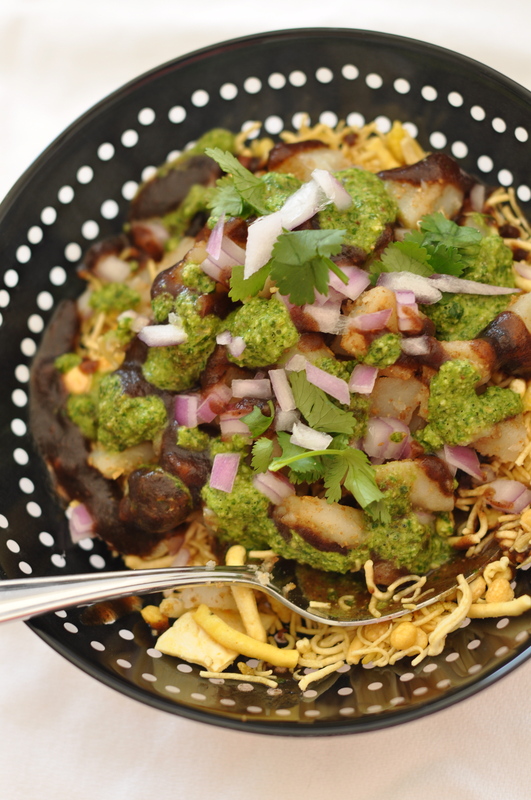 Sev Puri falls under the large umbrella of Chat, or snacks, along with its cousins bhel puri and pani puri. 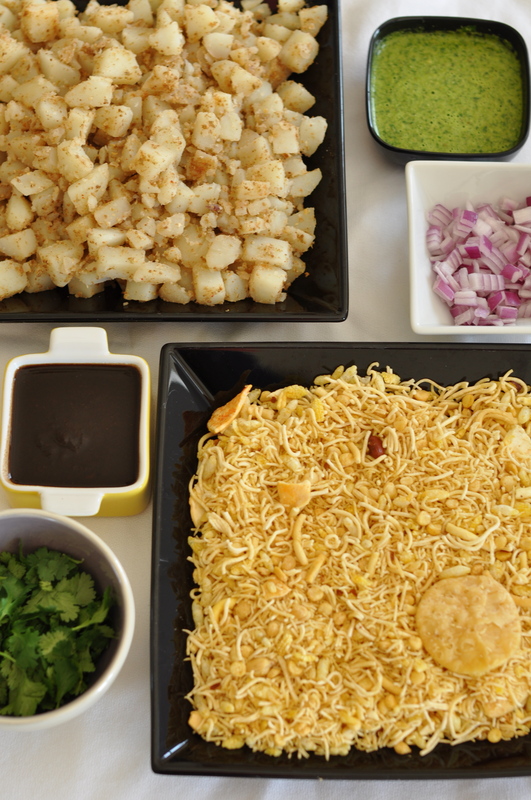 As with most iconic food, there is much variety in the method and lively debate about just what constitutes true sev puri and what does not. This version has been honed to my tastes, of course, but also to the ease and convenience of a lazy but satisfying pantry meal or an answer to the question “what should I feed all of these people who have suddenly appeared at my house?” Stored properly, the dry ingredients will keep in your pantry for months, the chutneys freeze well, onions & cilantro are cheap, and if you’re like me, you always have a random handful of potatoes hanging out somewhere, waiting to be cooked. Am I right? You can (and should feel free to) add tomatoes, a drizzle of yogurt, roasted chickpeas, sprouted mung beans, chopped Serrano or other peppers, even diced mango to your sev puri. For the bottom/crunchy layer of this snack, you’ll need to acquire a bag of packaged sev (fried bits of chickpea flour) and one of flat puris (small flatbreads, also fried). Your local Indian grocery may have a bagged “sev puri mix” with these two pre-combined—just ask. If you don’t use these up the first time, they’ll keep in the pantry if well-sealed in plastic bags. Boil the potatoes whole until soft and easily pierced with a fork. Cool, then peel and chop into half-inch chunks. Toss with the spices and mix well. Check for salt & taste but keep in mind that you’ll be adding many layers of flavor so you don’t want the potatoes to be overbearing. Set aside until ready to serve. 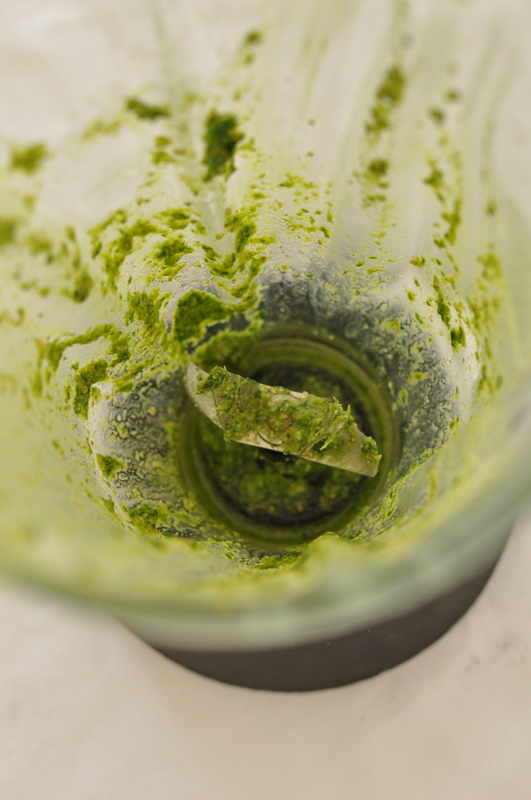 To prep the cilantro, wash it thoroughly and chop off the bottom portion of the stems. If you like, you can pick off the leaves and discard all stem pieces, but I honestly don’t find this is necessary—just cut off the tough ends. Process all ingredients in the blender, adding water until you reach your desired texture; I like mine just shy of smooth. Many people make imli chutney with dates or jaggery (palm sugar), but I learned from my mom to use apple butter instead and I think it’s way delicious-er. Combine all ingredients except water in a small saucepan. Heat on low, adding water to thin the chutney. Cook until the ingredients are incorporated, checking to be sure the flavors are balance. The chutney should be sweet, with a hint of fire and strong “pucker” from the tamarind. If you want more of any one flavor, add the corresponding ingredient. Cool before storing in the fridge and freezer. Be mindful that the chutney will thicken, so you may need to thin it again before serving. * If you can get your hands on homemade apple butter, do. Otherwise, it’s easy to find in the “peanut butter & jelly” aisle of your supermarket. I like to arrange the components along a counter or table so each person can assemble his/her own. In the bottom of a bowl, add a heap of sev and a few puris, breaking up the latter with a spoon or fork. 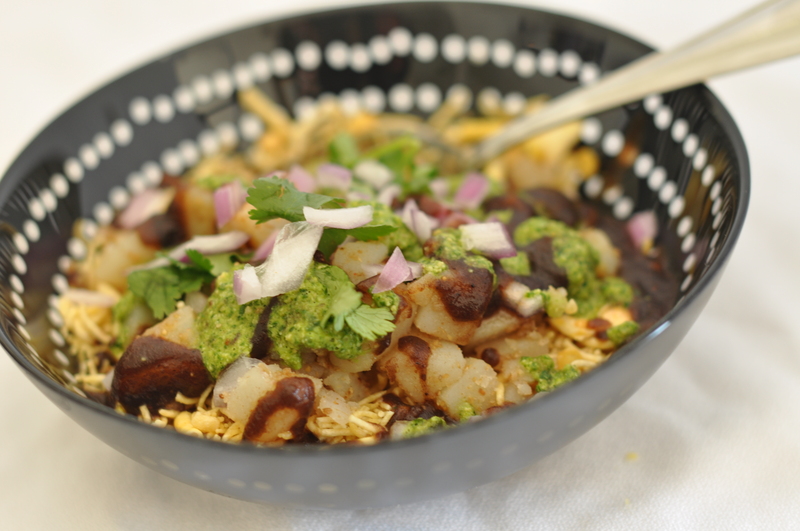 Throw on some potatoes, then onions if you like, then cilantro if you like, and generous drizzles of one or both chutneys. Hey folks…it’s bread week here at Blue Jean Gourmet! 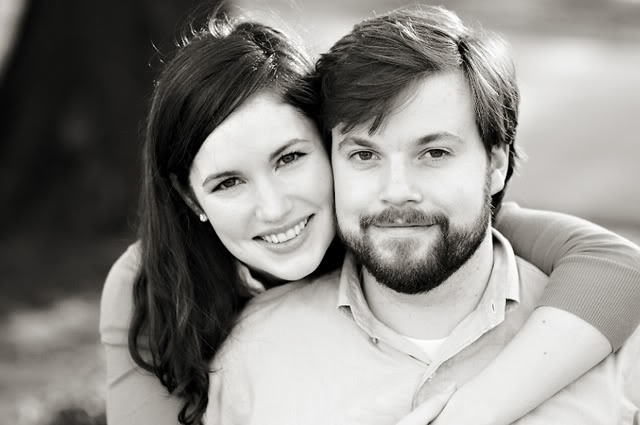 I’m lucky enough to know the beautiful & talented Jessie Fila, a friend from high school who now works as a pastry chef at The Schoolhouse at Cannondale in Wilton, Connecticut (full bio at the end of this post). She generously agreed to guest blog for me, sharing her bread expertise & recipes. 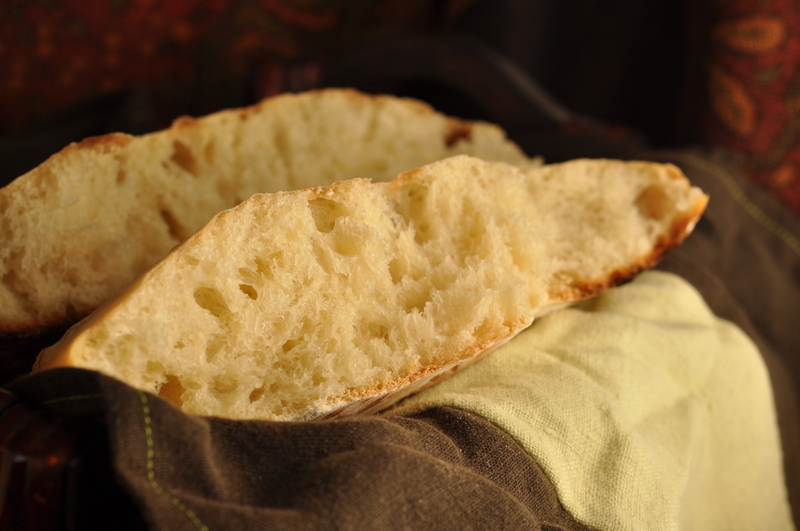 Today she brings us ciabatta–which, wow, I’m still dreaming about–and later in the week, challah! I don’t know about ya’ll, but baking bread has always intimidated me, so I decided Jessie’s guest posts would be the perfect opportunity for me to learn. I tested each of the recipes that Jessie sent, and let me just tell you–there was a lot of gratuitous moaning over fresh bread in my house each time. Are these recipes simple? No. They do require time and attention. But the thing is, they aren’t rocket science, either. Just make sure you aren’t in a rush and enjoy the process, it’s very gratifying. 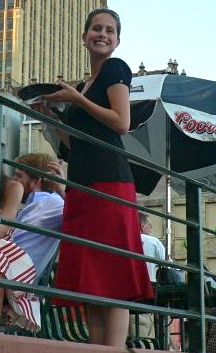 Big thanks to Jessie for being our bread evangelist! I love bread. I love everything about bread. And I don’t think I’m the only one, considering the idiom, “the best thing since sliced bread,” is one of the most popular comparative phrases out there. Truly, bread is by far and away one of my favorite things in the world. I could never get into the no-carb or low-carb diets because then I couldn’t eat bread! And who doesn’t want to eat bread? As much as I love to eat bread, I like to make bread from scratch by hand even more. There’s something therapeutic, meditative, and sometimes hypnotic about kneading dough that helps me focus and reflect just as effectively as any good yoga class. It’s also great exercise, building upper body strength, as well as working the core muscles. Indeed, making bread is one of my more favored pastimes. There’s nothing more rewarding than slicing into a freshly baked, warm loaf of bread, knowing you crafted it by hand. True, it is a labor of love, but it is well worth the effort. The key to making delicious bread is understanding the ingredients and the process. 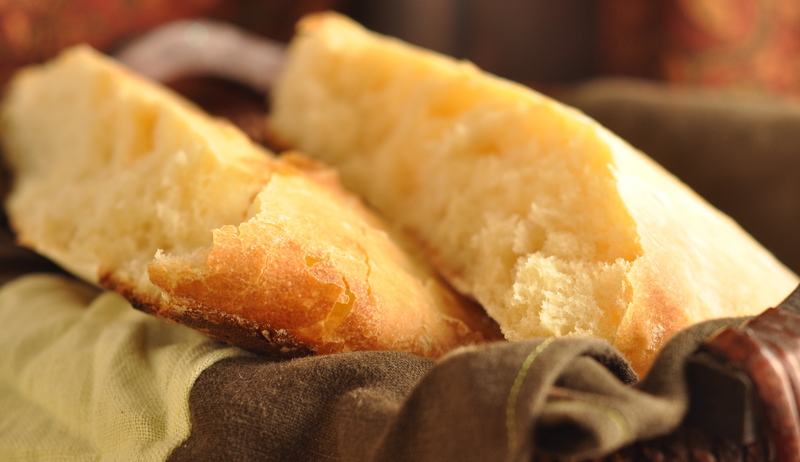 For most basic sandwich or rustic breads, such as white bread, a baguette, or ciabatta, the ingredients are simple: flour, water, yeast, and salt. 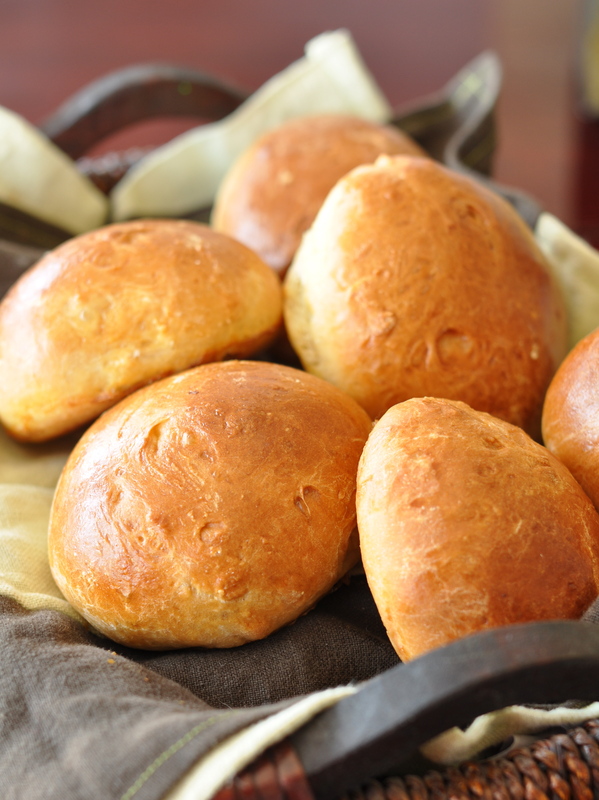 Other breads, called egg breads, like challah or brioche, call for eggs, butter, sugar, and milk in addition to the basic ingredients to help enrich the dough and make it less chewy, more dense, and flavorful. There are, of course, many other types of breads, but for this week I’m going to stick to these two main types. Most ingredients are straightforward in their purpose. Flour is used to give the bread structure and stability. When mixed with water, the proteins gelatinize; vigorous agitation and stretching help to develop these proteins into gluten. This agitation and stretching is exactly what you’re doing when you knead dough. In developing the gluten, you’re creating the unique dense and chewy structure of bread. Most bread bakers use bread flour instead of all-purpose flour because it has a higher protein content and will therefore create more gluten, resulting in chewier bread. Salt is used mostly for its definitive ability to flavor foods without adding its own flavor component. Salt is unique in the food world in that it doesn’t have a distinct flavor, yet it manages to enhance the flavors of everything in the dish it is added to. This is why even cookie and dessert recipes will call for a small amount of salt added to the dough or batter. Yeast is the one ingredient in my list that can be most difficult to work with. It comes in many forms these days, the most well-known being active dry. Yeast is a fungi, and is therefore a living organism. It is easily killed and is very finicky. It likes two main things: to exist in warm, wet environments and to eat. The water we use in bread is warm, between 105 and 115° F. If it is any hotter or colder, the fungi will not be able to survive and the bread will not rise. This brings us to what yeast likes to eat: the natural sugars found in flour. When the yeast eats the sugars, it processes the food like any other living organism. The yeast extracts what it needs from the sugars to survive and expels the rest as waste. Yeast’s form of waste is carbon dioxide. When the yeast gives off the gas, the CO2 gets trapped in the gelatinous structure the flour and water have created, otherwise known as gluten, pushing the dough upward, causing it to rise. This is the reason we let the bread rise a couple of times before baking, to allow the yeast to do its thing and give off the gas that contributes a strong amount of flavoring to the bread. The process for making bread is not as simple as making a cookie dough or a cake batter and is far more time-consuming. To start off, the yeast must be activated, allowing it to give off the much-coveted CO2 gas, and once all of the flour has been added, the dough must be kneaded. The kneading process is very rhythmic and is easy once you get the hang of it. Once you have your dough with all of the flour incorporated, turn it out onto a well-floured work surface, such as a counter. 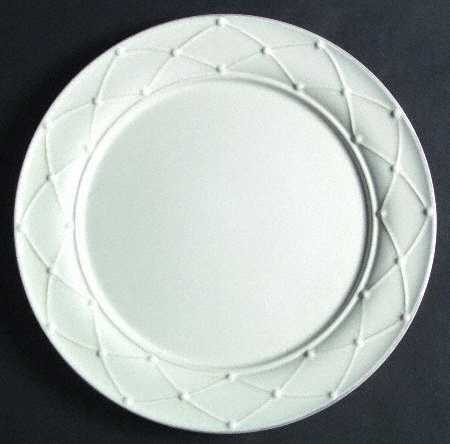 Shape it gently into a disk. Grasp the dough with both hands at the top and fold the dough into the center of the dough. Press down on the dough as if you were trying to fuse the top and bottom parts together. While pressing, use the heels of your palms to push the dough down and away from you. Give the dough a quarter turn clockwise and repeat the process until the dough is smooth. 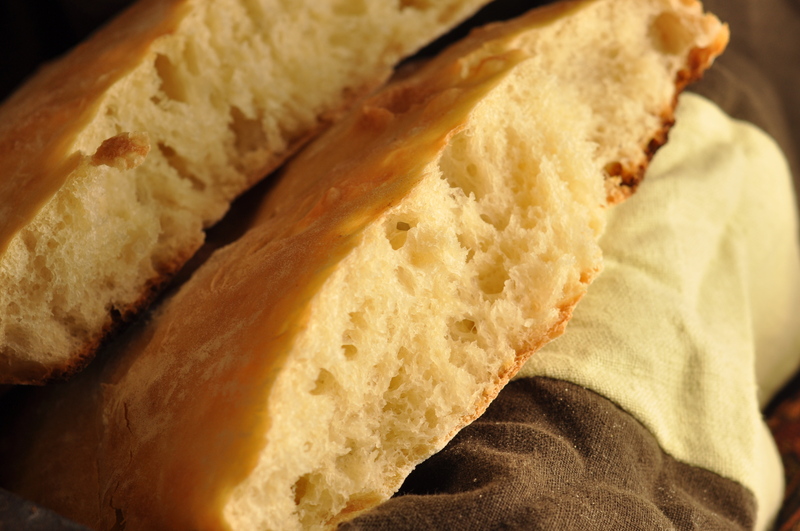 All bread takes time and effort to make, but ciabatta requires a little extra love and effort. This recipe makes use of a starter, which is used to feed the yeast and serves to add more flavor to the finished product (sourdough is another bread that calls for a starter). When timing the ciabatta, be prepared to make the starter at least 8-12 hours ahead of time so it has enough time to “proof” or ferment. 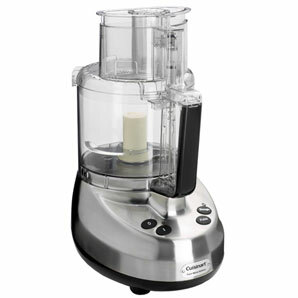 In the bowl of stand-mixer fitted with a paddle attachment, combine the water, 1 cup of the all-purpose flour, and the yeast. Mix on low speed for 1 minute. Add the remaining flour and mix until smooth and soft, 1 minute more. Cover the bowl with plastic wrap and let sit at room temperature until almost tripled in bulk, 4-6 hours. It will smell yeasty. Refrigerate for 8-12 hours or for up to 3 days. When ready to make the dough, remove the starter from the refrigerator and let it stand for 1-2 hours. 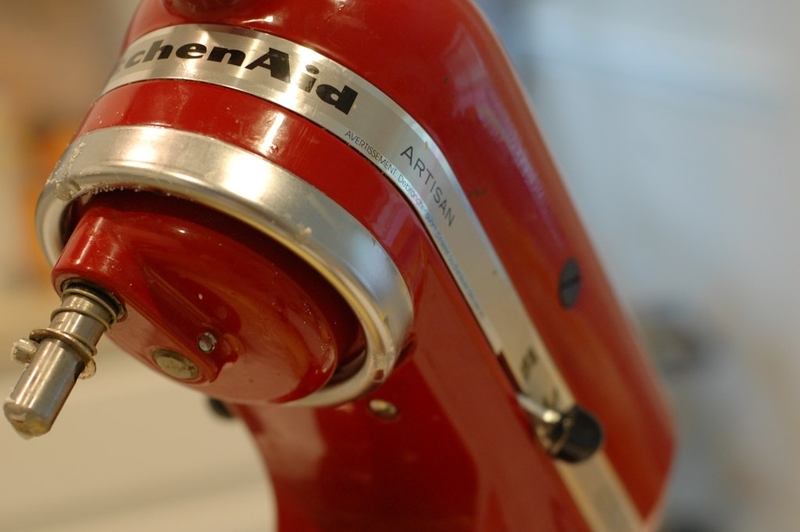 To make the dough, fit the mixer again with the paddle attachment. Add the warm water and milk and the yeast to the starter and mix on low speed. The mixture will be soupy. Add 1 ½ cups of the bread flour, the salt, and the oil. Mix on low speed until smooth, about 3 minutes. Add only as much of the remaining bread flour as needed to form a very soft and moist dough, and mix on low speed for about 5 minutes, occasionally scraping the dough off the sides of the bowl and the paddle. The dough should be very soft and sticky, pulling away from the sides, but still sticking to the bottom. Cover the bowl with the oiled plastic wrap and allow to rise at room temperature until doubled or tripled in bulk, about 2 hours. Line a baking sheet with aluminum foil and sprinkle generously with bread flour. Turn the dough out onto a lightly floured work surface (it will deflate), sprinkle lightly with flour, and pat with your fingers into a 14 by 5 inch rectangle. Fold the rectangle like a letter, overlapping the 2 short sides in the middle to make 3 layers. Cut crosswise into 2 equal rectangles and place each half on the prepared sheet pan. Cover loosely with plastic and let rest for 20 minutes. Remove the plastic and sprinkle generously with flour. Splay your fingers apart and press, push, and stretch each rectangle to make it irregular and about 11 inches long and about the width of your hand. You want the dimples in the top; this is traditional. Cover again loosely with plastic and let rest until tripled in bulk, about 1 ½ hours. Repeat the dimpling process again 2 more times during this rise. Preheat the oven to 425°F. Sprinkle the tops of the loaves with flour. Bake until deep golden brown, 20-25 minutes. Let cool on the baking sheet. Serve warm with olive oil for dipping. Yields two large loaves. Combine all ingredients in a bowl and toss to combine.This is my favorite combination for this salad, but you can increase or decrease any and all of the ingredients to suit your fancy. You can also try this with any veggies and any Italian cured meats, such as Proscuitto, . Any oil and vinegar combination works well with this recipe, too, and it is also excellent with citrus juice. In a heavy bottomed saucepot, heat the olive oil over medium heat. Add the onions, carrots, celery, and bay leaf and sauté until the veggies are softened and the onions are translucent, about 5-7 minutes. Add the garlic. Cook the garlic for about 30 seconds to 1 minute, or until the sharp aroma has subsided. Season with salt and pepper. Add the white beans, the tomato sauce, and the desired amount of stock. I would start with the lesser amount; more can be added later if the finished product is too thick. Allow to come to a gentle simmer. Once the stock is bubbling, tear off the ciabatta, crust and all, into big chunks and submerge into the stock. Once all of the bread is in the liquid, break it down and mash it around with a wooden spoon. If the soup is too thick for your liking, add more stock. I like mine stew-like and so thick a spoon can almost stand upright in it. Once the desired consistency has been achieved, add the spinach in batches, allowing to wilt in between additions. 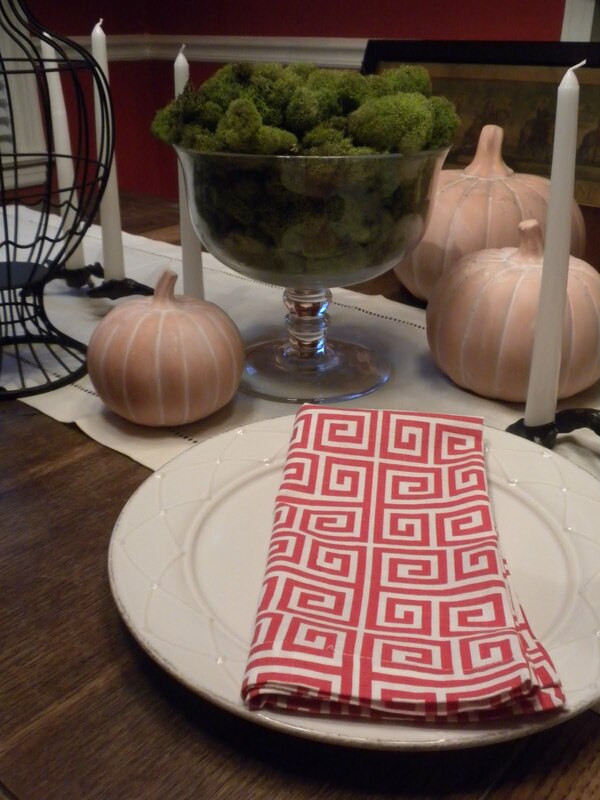 Turn off the heat, remove the bay leaf, and serve. Sprinkle with grated Parmesan cheese and drizzle with the olive oil. Jessie Fila fell in love with baking the summer after high school graduation when boredom led to a discovery that she is very good at pastry! After attending college in Florida, she traveled to New York to complete her Associates Degree in Baking and Pastry Arts from The Culinary Institute of America. She loves dessert because it’s often the most memorable part of any meal, and can easily make or break a diner’s experience. At home on days off, she cooks to relax and to feed her lucky husband Ken.